Tonight I received one of my biggest and most pleasant surprises at the eyepiece. It wasn’t using a half metre + monster, nor from an especially dark site. Rather, it was using my nearly 30 year old 2” f/12 Tasco refractor, and from my home in Sydney! Over a year ago I purchased an adaptor to allow me to use 1.25” eyepieces with this little refractor, with the idea of one day making it into a finder scope. Tonight I finally got to try it out, and dust off the little refractor after many years of being unused. What I didn’t expect was the image I was to see of M42. Even the eyepiece used was a modest Super Plossl 25mm. When I first used this little telescope, all I could see of M42 was the inner core nebulosity that surrounds the Trapesium. Tonight, despite the extra light pollution, but with 30 years experience, and I guess better eyepieces than the original, DIDN’T I SEE DETAIL!! I even managed to see the faint, nebulous glow that makes up the Running Man nebula too. 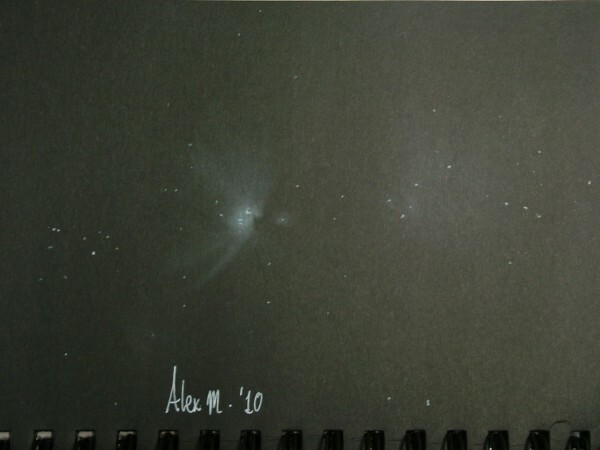 This is the first sketch I managed to do at the eyepiece, since my meeting with Scott Mellish, nearly 2 months ago! Scott, many thanks again for showing me your amazing technique. It has changed the way I sketch DSO’s with a pencil, paper and a dry paint brush! Excellent rendering of my favorite deep sky object. Really neat work, you have got that soft nebulous touch just right. Wonderful, little scopes are treasures too. It has been a thrill to discover this site this year. I have gained so much from your contributions that it has inspired me to return to sketching in a way I’ve never imagined. Even the range of scopes I’ve used amazes me, from my little 2″ through to my 17.5″. As you said, Frank, “little telescopes ar treasures too”. So my moto now is “Use what you’ve got at hand. You will always grow an learn with it”. Happy New Year everyone. Clear skies and sharp pencils!